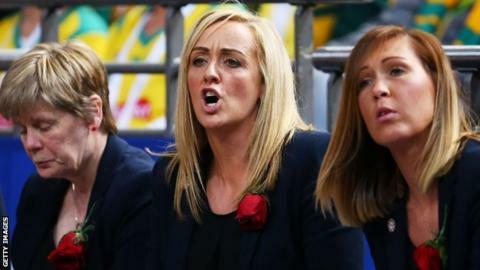 England head coach Tracey Neville says her father would have supported her decision to stay with her team for the remainder of the Netball World Cup. Neville Neville, 65, died in hospital in Sydney on Friday, the day of England's first World Cup match. His daughter wiped away tears as the national anthem was sung before her side beat Scotland 60-19 in Pool B. "My dad was one of my number one fans and probably would have a thing to say if I'd bailed at this stage," she said. "You don't get this far and then bail out. That's not been the mentality of me or my family throughout our careers." Mr Neville, whose sons Gary and Phil played football for Manchester United and England, was in Australia with his wife Jill to support their daughter during the tournament. Neville, 38, told BBC Radio 5 live she was staying to oversee the England team's World Cup campaign because it was where she wanted to be. "All the other things I'm going to have to deal with at some point but at the moment the right thing for me is to be here in Sydney with my team," she said. "We've got one of the hardest weeks of our lives and that's something that remains in my focus at the moment." England, who wore black armbands for their second match, a 54-50 victory over Jamaica, secured top spot in Pool B by beating Samoa 85-34 in their final preliminary-round match on Sunday. Among the teams they will face in the next round-robin stage of the tournament are hosts and holders Australia. Round two of the competition in Sydney starts on Tuesday, when the 16 nations split into four pools of four teams. The first two pools are made up of the teams who finished in the top two of their preliminary-round groups, and a round-robin format will decide who progresses to the semi-finals. The other two pools will filter into the play-offs for the placing matches. "We are in Sydney and the majority of the crowd is going to be for Australia but we have to be on task and concentrate on what we're doing," Neville said. "It will be an exhilarating experience. I'm sure the Kiwis will be barracking for the English side to win and there's a lot of support behind us."